Kinship, the new Shaw restaurant from Chef Eric Zeibold, has an obvious mission that plays on its name. Kinship is doing its thing right out of the gate, enabling guests to revel in an exemplary dining experience. The restaurant has an under-stated elegance that conveys upscale but at the same time cool. The menu displays an alluring combination of elevated classics like roast chicken, and indulgent dishes such as Japanese Kuroge beef. It’s not surprising that Chef Ziebold has debuted a restaurant that delivers impeccable food. 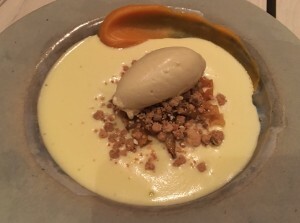 He has an impressive background, with ten years as Executive Chef at the top-rated CityZen, which the Mandarin Oriental Hotel closed in late 2014 after he departed. He also spent eight years at the French Laundry in Napa Valley. A meal at Kinship can veer in a variety of directions, depending on your appetite and how much you want to spend. The menu necessitates concentration, as it is not immediately clear how its organized. Desserts are sprinkled throughout sections labelled craft, history, ingredients, and indulgence. I consider ordering ruby red grapefruit terrine with tapioca ice cream as an appetizer, because it’s listed in the first section of dishes. I’m swayed by tradition, but next time I may just go for it. If your heart is set on the roast chicken, be prepared to wait. The dish, intended for the table, is $56 and takes an hour to prepare. When the golden beauty finally makes a brief appearance at the table, it’s whisked away and cut into pieces. It easily serves 3-4 people, depending on what else you order. The citrus-infused, succulent bird is simple and sublime. The crisped potatoes that come with it complete the package. 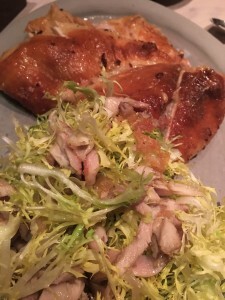 The chicken is accompanied by a frisée salad laden with chunks of roast chicken. It seems superfluous to the main course, and we take some home. It has great appeal the next day, when it’s not overshadowed by other more fanciful dishes. The craft section of the menu celebrates cooking technique. 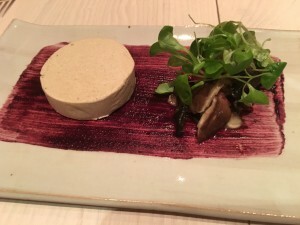 Torchon of white mushroom, chioggia beet and wild mushroom salad with a huckleberry gastrique mimics the smooth texture of foie gras, minus the meaty taste. It is our first bite at Kinship, and the intricate flavors engender smiles on our faces that remain throughout the evening. 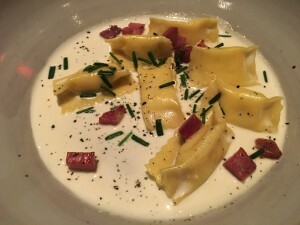 Parmigiano reggiano agnolotti is a dreamy dish, exquisitely enhanced by pieces of crunchy darden ham, micro chives, and cracked pepper. A few bites leave me wanting more. 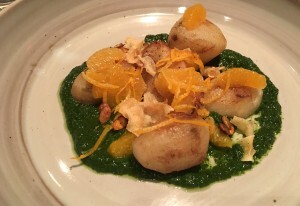 Path Valley Farms sunchokes with clementine segments, toasted pepitas and cilantro chimichurri shine a spotlight on stellar ingredients, in keeping with the intention of this section of the menu. Save bread to scoop up the sauce, as it’s not likely you’ll want to leave a morsel behind. Although, the bread is so good you may want to keep it intact. It’s a dilemma. 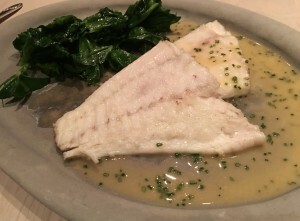 Another selection that’s “for the table” is whole roasted turbot with roasted pea shoots and pommes boulangere. This is another dish that is enjoyed for its skilled simplicity. The petite Parker House rolls that accompany the chicken and fish are a delight, particularly to those of us who fondly recall them from CityZen. The wine list is expansive, and a pleasant surprise, with selections spanning the spectrum of prices. I thoroughly enjoy Château Guirauton Blanc, a Sauvignon Blanc/Sémillon blend at $9 a glass. 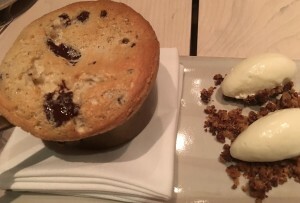 Chocolate chip cookie dough souffle with milk ice cream at $24 is over the top. It’s gooey and warm and quite good, but $24? I’m equally content with sticky toffee pudding with Meyer lemon marmalade, fig membrillo, butterscotch, and earl grey ice cream. And it’s half the price. A complimentary plate of toffee served with a miniature hammer is a playful touch that ends the meal on a sweet note. Kinship is interesting and genuinely appealing, and best of all it fulfills its mission. It may be chilly outside, but we feel the warm embrace from this distinctive new DC restaurant.